Barbara Carey didn’t know what to make of her best employee, Joe Till. Joe had been here at the farm for nearly six months. He was good with horses. Very good with horses. The kind of guy you could trust to do what you asked. You could go away and leave them in his care and they would be fine. Not just fine, but better than fine. She’d been looking for a foreman but took Joe Till on as hired help. He had no references, but she could tell he knew his way around a horse. She had tested him by handing over the lead rope to the colt she had been taking back to the barn. Till knew what he was doing. The colt was high-strung and had a tendency to bear in on people, from leaning on them to running them over—a very bad habit. The man handled him like a pro. He was strong and authoritative without being angry. The colt backed down and followed Till to the barn and walked right in. Not exactly horse whisperer stuff, but he was definitely experienced. And he was decent-looking in a rugged kind of way. Her long-dead father’s favorite movie was Shane, and this man reminded her of the film’s title character. He had an air of mystery about him, as if he’d lived a tough life. There was a small scar above his upper lip. Could have happened with horses but she didn’t think so. He seemed level-headed, although he gave the impression he would fight back if someone tried to crowd him. Regarding the foreman position she’d put in the newspaper and on the internet, there had been no takers—she wasn’t offering a lot of money—and so eventually Joe Till ended up filling a foreman’s shoes. Barbara still ran the ad in the paper on and off, but wasn’t really looking anymore. Joe Till wasn’t just good with the two-year-olds, he had an eye for them. He knew what they were going to do before they were going to do it. He knew them cold, every single one of them, as if he had read their most secret diaries. He understood their potential or lack thereof. Somewhere along the line he had clocked hours, days, weeks, months and years to be able to handle horses this way. She found herself relying on his advice more and more. What do you think of this colt? What do you think about this race for the filly’s first start? Do you think this boy will ever make a racehorse, or should we cull him? If she’d just met him, say at Hollywood Park or Santa Anita, she would have thought he was an assistant trainer to one of the Big Guys. So… how’d she get so lucky? Joe was no spring chicken. Barbara guessed he was in his mid-to-late forties, and a beat-up-looking mid-to-late forties at that. Good-looking, although she wasn’t really sure about this, because if she tried to picture his face right now, she wouldn’t be able to. He was the kind of guy who would never stand out in a crowd, except for his height. He was tall. He wore the uniform of the men who worked around horses: knit polo shirt, jeans, a ball cap with the farm’s name on it, and tennis shoes. Gum boots when it was muddy. He drove an old, beat-up Dodge Ram. Joe Till didn’t seem to have any bad habits. He didn’t drink. He didn’t smoke. He didn’t act lascivious with her or the women she worked with. He liked the room she gave him just fine, washed the dishes after she cooked up dinner, used his own hotplate when she wasn’t in the mood to cook. That first day, Barb was surprised he had only one big duffle, which went with the fact he was former military. Couldn’t miss that. Her two brothers were former military. He was the kind of guy you’d see at the racetrack or on a breeding farm or at a training center all the time. A horseman with a forgettable face. Except his face had been transformed to handsome somewhere along the line. Maybe around the time she’d first slept with him. Barbara lay in the crook of Joe Till’s arm. The birds had just started up, mourning doves mostly, and the golden Santa Ysabel light stole across the bright green pastures and into her room. She felt as if she were lying in the arms of a giant bear. She’d been on her own for a century, it seemed, but here with Joe, Barbara felt something she hadn’t felt for so long. His breathing rose and fell as if he were asleep. But she knew he wasn’t asleep. She knew he was awake and alert. There was something preternatural about the way he could lie still, appear to be asleep, but never was. He’d told her he “slept with one eye open” and she believed him. Both her brothers were like that. There was a wariness to them both, as if they were always expecting someone to shoot at them from over the next hill. Her younger brother had suffered, though—nightmares, getting fired from jobs, drinking and drugs. Lots of problems. But her other brother was fine. Don’t overthink. Joe Till’s the best man you ever met. She moved in his arms and he stirred. “Oh?” His smile looked lazy, but it wasn’t. She didn’t know how to think of it other than that. He trailed a finger along the hollow of her neck and she shivered with pleasure. He straightened his right arm, looked down at her, and smiled. She was surprised by the words as they tumbled out of her mouth, but she’d been thinking it. Midnight Auto, Pussycat Doll, Mexican Lucky, Chillax, Nowhere Man, and A Whiskey Girl. She saw his lips move. Heard the words. Thought: this is crazy! What is wrong with you? Here’s your chance! This could make you. This could make you be someone I could fall in love with. Did she say it out loud? But he was looking at her as if he’d heard her say it. As if he’d read her mind. He continued to caress her jaw. His finger trailing along her jaw and down into the hollow of her throat. And suddenly, she was scared. He was former military. Sometimes they came back broken. Most times, in her experience. His body was hard—honed–almost as if he was a weapon kept sharp. But his hyper-awareness. She had to admit, sometimes that spooked her. Abruptly, she felt as if she were walking down a dark road at night all alone, and headlights appeared in the distance, while she was alone on the road and vulnerable. The sight of the headlights–the thought of who might be on that road coming her way—caused a tiny stab of fear. The kind you were embarrassed by and you said to yourself, don’t be silly. That was what it felt like. He gently traced the hollow of her throat. “It’s okay,” he said. “Okay?” Her own voice faint in her ears. Abruptly, she did feel silly. In fact, she felt ridiculous. He was Joe, her Joe. Then he kissed her on the lips, and before she knew it, they were making love. The dark lonely road, the headlights in the distance, were forgotten. Cyril Landry is off the grid. Presumed dead, the ultracompetent ex-Navy SEAL with a lethal skill set has withdrawn to the tranquility of a rural horse ranch. But when an act of shocking violence impacts his estranged family, Landry suspects that somebody who knows he's still alive is messing with him to draw him out of hiding. And that's a mistake. Because nobody messes with Cyril Landry. 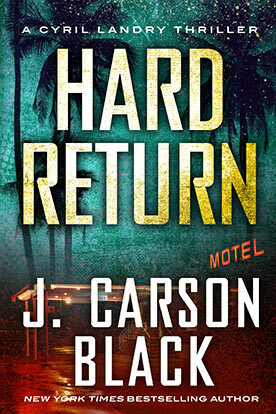 Sweeping from suburban California to the New Mexico desert, from an assassins' marketplace in Austria to the killing grounds of Iraq, HARD RETURN is an amped-up thrill ride showcasing one of the most enigmatic and unforgettable antiheroes in fiction today. Part Jack Reacher, part Jason Bourne, Landry is a loner, a lover, a father, a killer, and the last thing his enemies will ever see.